Very sad. I happen to be in Cameroon at this time. The incident took place in another region. There's been a lot going on there. Still not clear on whether accidental (stray bullet) or intentional. Dave Halyaman, assistant pastor at Believers Baptist Church in Warsaw, Ind., which sent Wesco and his family on its mission to Cameroon, told The Washington Post that the church “is grieving greatly the murder of Charles Wesco, but we are also trusting God that he has a purpose in all of this.” The congregation’s senior pastor is Wesco’s father-in-law, he said. 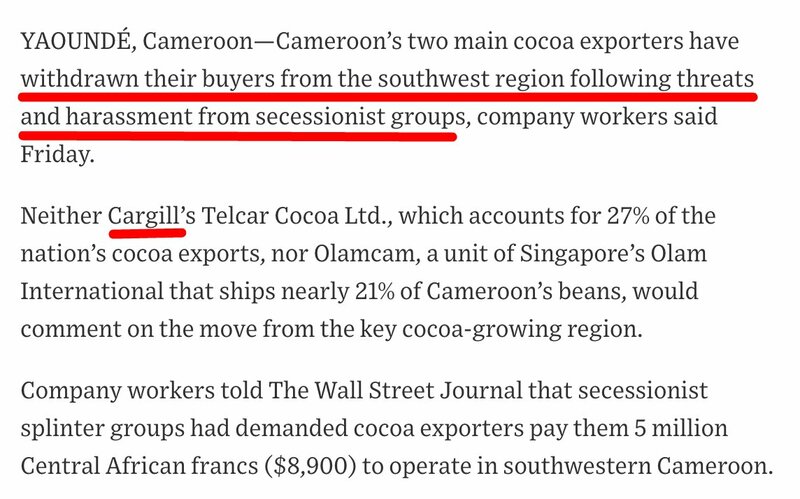 The family was living in a suburb of Bamenda, a major town in Cameroon’s northwest Anglophone region, Halyaman said. 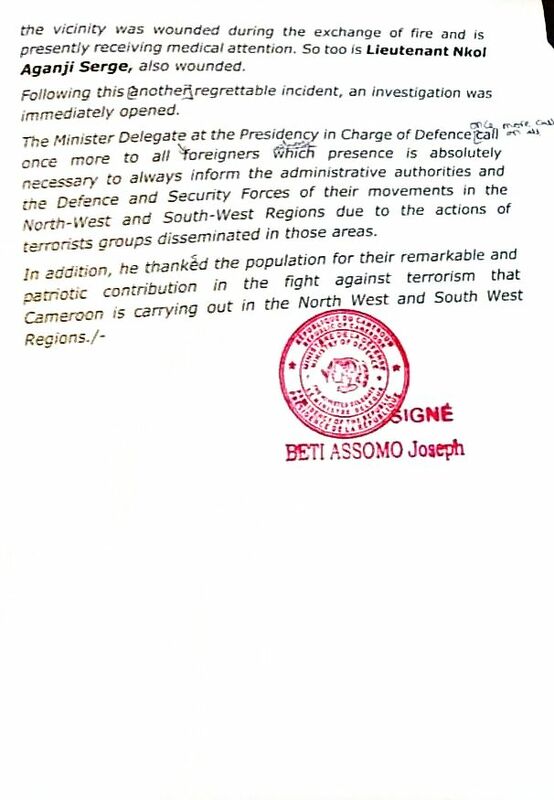 Unrest broke out in that region in late 2016 over complaints that the Anglophone community was being marginalized by Cameroon’s central government, which is largely controlled by French speakers. The country is bilingual, but Francophones have historically held more governmental power than English speakers. Security forces stifled peaceful protests in the Anglophone regions, and an armed separatist movement emerged. Around 400 civilians have been killed in violence in the country’s two Anglophone regions. Tens of thousands have fled the country as refugees and others are now internally displaced. Halyaman described the area they were in as having “a lot of high weeds.” On social media, some placed the blame on government troops and others on armed separatists, but Halyaman said it was not immediately clear who shot at the vehicle. 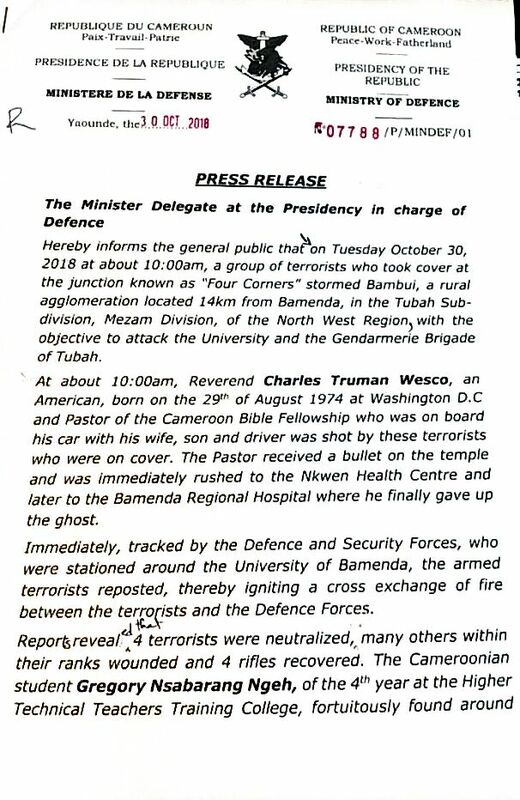 Cameroonian Defense Minister Joseph Beti Assomo released a statement saying that “a group of terrorists” shot at Wesco’s vehicle around nine miles from Bamenda, striking him in the temple. Security forces tracked the group, the statement said, then engaged in crossfire with them, killing four. A U.S. State Department official confirmed to The Post that an American citizen died in Bamenda on Tuesday but did not offer further details. 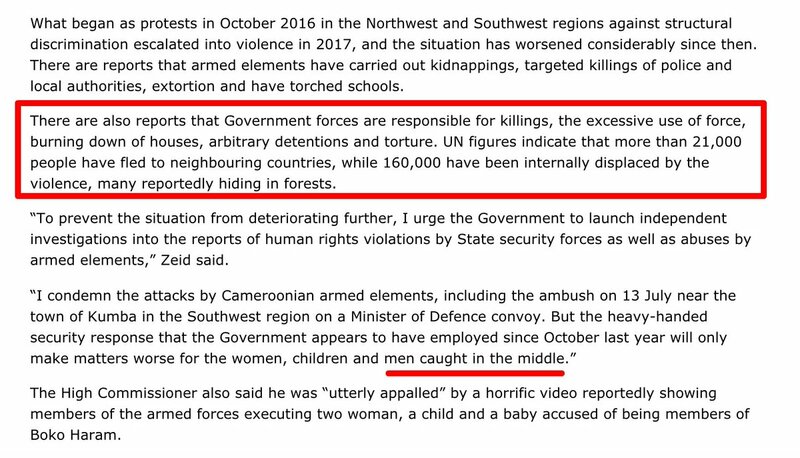 Doctors Without Borders, the international aid group that goes by the initials MSF, told The Post in an email that “an MSF ambulance transported the man” who died in Bamenda, and that he died at a hospital supported by the group. An American missionary died in northwestern Cameroon after being shot in the head Tuesday amid fighting between armed separatists and soldiers, the director of the regional hospital said. “He died in our hospital after all attempts to save his life,” Njie told The Associated Press. Wesco’s wife and eight children were still in Bamenda, he said. It was unclear if any of them were harmed or if someone else was with him in the car. Charles and the entire Wesco family have been great friends and supporters of Dr. John Whitcomb and Whitcomb Ministries. We grieve with his family at this time of loss, but rejoice that Charles is with the Lord in heaven. Virgil Wesco, pastor emeritus of Fellowship Baptist Church in South Bend, Indiana, and his wife, Rebecca Wesco, told NBC affiliate WNDU of South Bend that their son Charles was killed as he and his wife were returning from shopping. 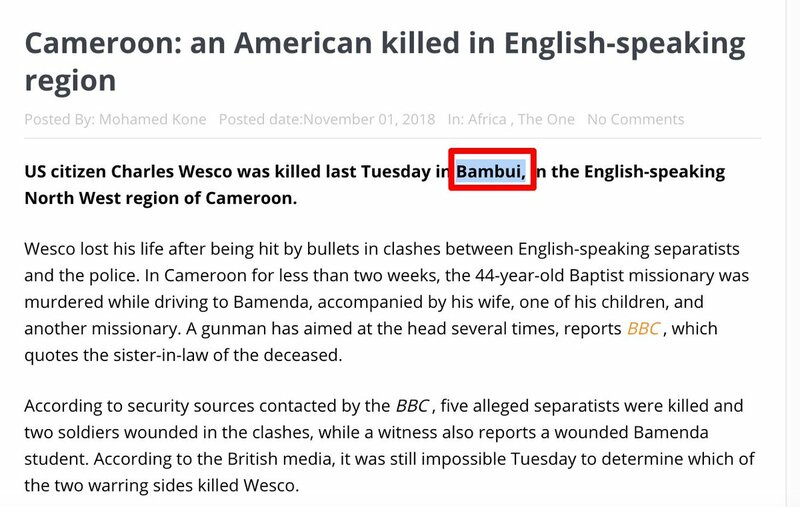 Robert Paladino, a spokesman for the State Department, confirmed that a U.S. citizen had been killed in Cameroon, but he said he had no further information. Armed separatists in the region have called for a boycott of local schools, contending that the French-language schools discriminate against English-speaking students. Wesco's parents said their son and his family had spent the last two years planning for their mission to Cameroon. 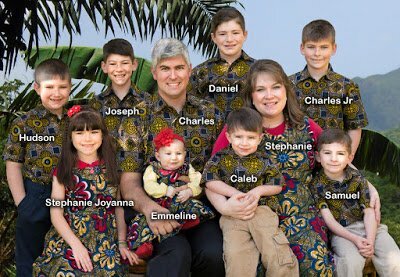 Charles and Stephanie Wesco moved to Cameroon with their eight children about two weeks ago, they said. 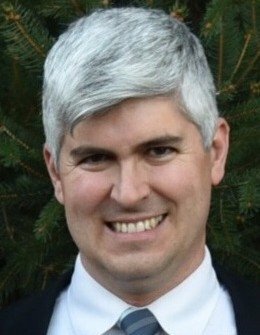 Wesco served as assistant pastor of Fellowship Baptist Church in South Bend, where his father is the pastor emeritus, his parents said. "My husband has already prayed for his killer," Rebecca Wesco said. "Charles would want us to do that." Virgil Wesco said: "He cared for the people, and he was willing to risk his life to go to them." The Wescos were in our church earlier this year. Exceptional, talented family. I was in the extreme north of Cameroon 11 years ago exactly at this time of the year. The country was relatively stable then. The missionaries we supported in the extreme north eventually had to leave because foreigners were being kidnaped for extortion. One of those families will be in our church this Sunday. The Wesco family had spent years raising funds for their move to Cameroon, said Pastor Dave Halyaman of the US-based Believers Baptist Church, which sent the family on the mission. He told the BBC that Mr Wesco's wife, Stephanie, had described her husband's death as a tragedy but she said that she believed God allowed it for a purpose. He said the church was being assisted by the US State Department in their efforts to bring the Wesco family home to the US "hopefully in a week or less". “He was smart," Halyaman said, "and he had a good heart, too, "
Thank you for these continued updates. My former church had a very good relationship with the Williams family, and through them, knew the Wescos. We are, of course, saddened for the family and children for the abrupt loss. "Go and Preach ... Five Do and Die"
Arrangements are pending with Redpath-Fruth Funeral Home, 225 Argonne Road, Warsaw, Indiana. PLEASE CHECK BACK FOR UPDATED FUNERAL SERVICE TIMES. THANK YOU. Charles Truman Wesco went home to be with His Lord and Savior while serving the Lord as a missionary in Cameroon, Africa on Tuesday, October 30, 2018 at the age of 44. Charles was formerly of Warsaw, Indiana. Charles Truman Wesco was the firstborn of ten children, son of Virgil and Rebecca (Walter) Wesco of Mishawaka, Indiana, born on August 24, 1974, at K.I. Sawyer AFB in Michigan where his father was serving in the military. He was named after his grandfathers: Charles Walter and Truman Weco. He grew up as a Pastor’s child in churches in the Midwest. When he was 12 years old, his grandparents gave him a tuning hammer, and he began tuning hammer and he began tuning pianos at Walter Piano Company. Because of the blessing of working in his grandparents’, (Charles and Barbara Walter) piano company, Charles learned how to tune pianos and worked and saved to prepare for a family. This also supported him when he served in ministry. He also attended Midwest School of Theology, Northland Baptist Bible College, and Baptist College of Ministry to receive Bible training. Charles served as an assistant pastor at Fellowship Baptist Church in South Bend, Indiana for 10 years. He loved working with the young people and started a Bible Institute to help see them trained and equipped to serve the Lord. It was his heart’s desire to see young people have a walk with God and to be surrendered to Him. He also served at Believers Baptist Church in Warsaw, Indiana. He is survived by his wife, Stephanie and 8 children-Daniel, Charles Jr., Joseph, Hudson Taylor, Stephanie Joyanna, Samuel, Caleb and Emmeline. His parents, Virgil and Rebecca Wesco, and siblings-Jonathan, Virgil Jr., Ruth, Stephen, Timothy, Nathaniel, Karisse, Lawrence and Joel, as well as in-laws and many nieces and nephews. His grandparents, Charles and Barbara Walter. Also surviving him are his wife’s family, who dearly loved him: Donald and Wenda Williams, Faith, Grace, Stephen, Hope, Joy, Mercy, Mary, John, Daniel, in-laws, and nieces and nephews. He was preceded in death by his grandparents, Truman and Zelma Wesco and 3 children, Hosanna, Peace and Rose. Charles loved all of his family dearly and desired that each one would love the Lord God with all their heart, soul, mind and strength. Halyaman said that Wesco, his wife and one of their sons were traveling with another missionary to go shopping on Tuesday morning when at least two shots were fired, striking the windshield and hitting Wesco twice. 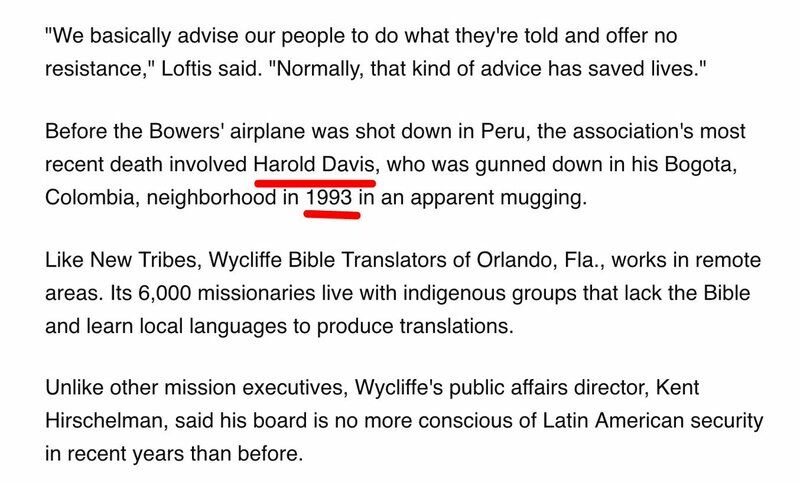 I personally know the other missionary that Wesco was traveling with when he was murdered. I have no idea where he is or how he is doing right now - we last spoke a few weeks ago - but I'm sure that he and his family will also appreciate our prayers. Once I know how he is doing for sure and what their immediate plans are, I'll post an update. Pictures from our church blogsite from March 2018 when the Wescos were at our church. The missionary with Charles Wesco. "She, her children and her extended family have been praying diligently for the man that took Charles' life," he said. "We do not know the name of that man. But I pray as a missionary to Cameroon that I or her brother Ben Sinclair might one day have the opportunity to meet Charles' killer to express our forgiveness to him and in love, seek to lead him to repentance and faith in Jesus Christ as his Lord and Savior that he might also receive God's forgiveness for what he did." "Moments after Charles was pronounced dead, a Cameroonian Christian doctor bowed and thanked Stephanie for her and her husband's willingness to come to Cameroon to die for his people," King continued. A Go Fund Me account has been set up to benefit the Wesco family. "The funds will go to aid the family in getting out of Africa, funeral expenses, living expenses, etc. Every little bit will help. The family sold all of their possessions here in the states to go to Africa and they will have many needs when they return," according to the website. There is also a mailing address included on the website for those who wish to mail a personal check.